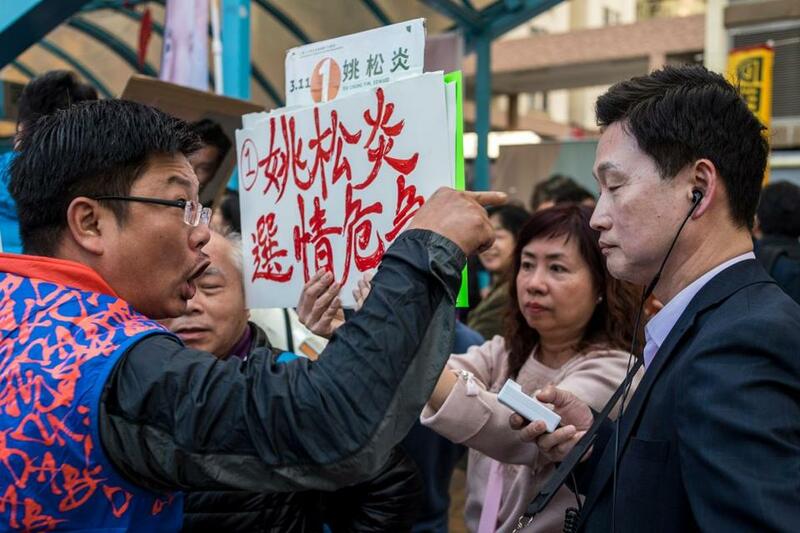 A supporter (left) of pro-Beijing candidate Vincent Cheng shouted at a supporter of pro-democracy candidate Edward Yiu during campaigning for the Legislative Council by-elections in Hong Kong on Sunday. HONG KONG — Hong Kong prodemocracy candidates won back only two of four seats in a crucial by-election in the semiautonomous Chinese region, final results showed Monday. The results mean the opposition wasn’t able to recapture all its territory, losing some to formidably resourced pro-Beijing rivals in the city’s semidemocratic legislature. The four seats were among six left empty when a group of lawmakers were expelled following a 2016 controversy over their oaths, which they used to defy China. Little-known activist Au Nok-hin won a key battleground. He was enlisted at the last minute after officials rejected the prodemocracy camp’s marquee candidate, 21-year-old Agnes Chow, because she advocated for Hong Kongers to determine their own future. Chow said Hong Kong’s younger generation hopes for democratic development. Chow had intended to stand for the seat vacated after the disqualification of Nathan Law, a fellow member of their Demosisto party who became Hong Kong’s youngest-ever lawmaker. The two were among a wave of young activists who emerged from the massive but inconclusive 2014 ‘‘Umbrella Movement’’ demonstrations against Beijing’s plans to restrict elections for Hong Kong’s top leader. The disqualifications of lawmakers and candidates have raised fears among activists and international groups that Hong Kong’s Beijing-backed government is taking an increasingly hard line on dissent. Au had called the vote a referendum on democracy in Hong Kong, but the prospect of democratic development looks increasingly distant after China’s rubber-stamp parliament voted Sunday to abolish presidential term limits, allowing President Xi Jinping to stay in power indefinitely. Under the ‘‘one country, two systems’’ framework, Beijing promised to let Hong Kong maintain wide autonomy and civil liberties following its 1997 handover from Britain but fears are rising that China’s communist leaders are backtracking. About 43 percent of 2.1 million eligible voters cast ballots for three Legislative Council seats. Edward Yiu, who was the only one of the disqualified lawmakers to compete again, narrowly lost to a pro-Beijing rival after a nail-biting recount. A third prodemocracy candidate, Gary Fan, won his constituency. In a fourth race, architects and surveyors elected a pro-Beijing candidate over Dutch native Paul Zimmerman — business and trade groups account for about half the council’s 70 seats. Two of the empty seats will be decided later because of ongoing legal action. A handful of prodemocracy supporters protested Sunday outside the polling station where the city’s top leader, Carrie Lam, cast her ballot and some pro-Beijing supporters heckled noted democracy activist Joshua Wong outside a campaign stop. Voting otherwise went undisturbed for the election, which attracted little attention — no opinion polls were conducted and there was no televised debate by the city’s largest broadcaster. Under the Basic Law — the mini-constitution that has governed Hong Kong since Britain returned it to China in 1997 — the territory maintains its own courts, government, and economic system. That guarantee expires in 2047. What comes next is already a source of deep concern in Hong Kong, and many residents fear that Beijing is even now quietly chipping away at the Basic Law. Au and his opponent, Judy Chan, both campaigned on promises to uphold the rule of law, a deeply held value in Hong Kong. But they had very different interpretations of what that means. For Au, it means resisting Chinese influence over Hong Kong’s political and legal systems. Chan argued that those resistance efforts themselves, including street demonstrations and filibustering by the prodemocracy camp in the legislature, undermine rule of law.